20 | TH E M R EP O RT FEATURE T here are a number of challenges mortgage lenders need to be aware of in their mar - keting and communi- cation efforts, including advertising. The agencies and the regulations covering deceptive advertising and fair lending are more than just an alphabet soup of government acro - nyms. And they're not something only your compliance officer needs to be aware of. Advertising in all forms is most certainly on regulators' radars. They're looking for violations as - sociated with a number of laws, including fair lending and the prohibition on unfair, deceptive, or abusive acts or practices (UDAAP). The things covered by these regu - lations and the penalties for violat- ing them might surprise you. Prior to passage of Dodd-Frank, legal enforcement for Unfair, Deceptive Acts and Practices (UDAP) in lending and com - merce fell to the Federal Trade Commission (FTC). Under Dodd- Frank, the rules were expanded to include "abusive" acts, add - ing enforcement powers to the Consumer Financial Protection Bureau (CFPB). As a result, there is now an overlap in the enforcement pow - ers of the different federal agencies for UDAP and UDAAP viola- tions. If you're not careful, failure to understand this change could put your company in double jeopardy. There's more here than just an extra letter "A." The CFPB has adopted the same definitions as the FTC for what is considered to be "unfair" and "deceptive." So when a lender is found to be in violation by the FTC, odds are the same entity will be audited and found to be in violation by the CFPB, and vice versa—the double whammy. Further, the FTC and CFPB entered into an agreement, via a Memo of Understanding, to work together to coordinate their en - forcement of UDAP and UDAAP. Under this agreement they: • Meet regularly to discuss their activities; • Notify each other before beginning an investigation or bringing an enforcement action, or prior to filing any consent order, decree, or settlement agreement; and • Consult on final UDAAP rulemaking. The CFPB has made clear its focus will be on fair lending in 2017. This will include redlining as well as unfair, deceptive, and/or abusive advertising. 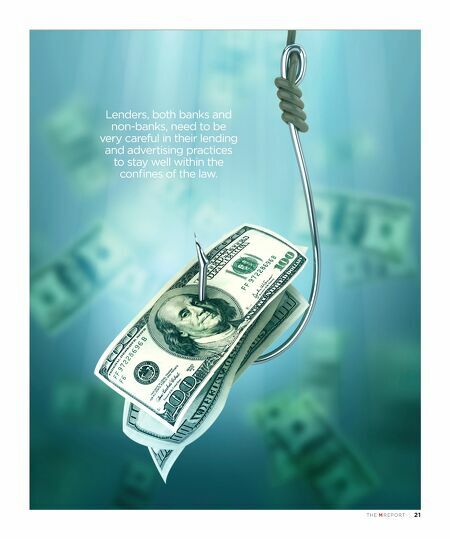 Lenders, both banks and non- banks, need to be very careful in their lending and advertising practices to stay well within the confines of the law. Otherwise, they'll face the two-pronged approach to UDAAP enforce - ment from both agencies, not to mention the potential for further action from state regulators. The CFPB might also add a claim of redlining for good measure—you just never know. Understand "Unfair" and "Deceptive" S o, what exactly constitutes "unfair" and "deceptive"? In general: Unfair is an act or practice that causes, or is likely to cause, substantial injury or harm to con - sumers which they cannot reason- ably avoid, and is not outweighed by a countervailing benefit to the consumer or competition. Deceptive is an act or practice that is a material misrepresenta - tion, omission, or practice that is likely to mislead a consumer when the consumer is acting reasonably. What about "abusive"? Dodd-Frank added the element of an act being "abusive." This is one that materially interferes with a consumer's ability to fully understand a term or condition of a financial product or service, or one that takes unreasonable advantage of the consumer's lack of knowledge and understanding of the risks, costs, or conditions of the product or service; their inability to protect their interest; or their reasonable reliance on the lender to act in their best interests. The following are some exam - ples of what regulators consider to be violations of UDAAP and fair lending laws: • Possible inaccurate information about interest rates, such as indicating a "fixed" rate for a variable rate loan • Misrepresentations of govern - ment affiliation • Misrepresentations that the consumer is pre-approved for or guaranteed specific rates or terms • Not offering the same products at the same rates in all areas serviced • Failure to indicate a rate is a low introductory rate that will increase after a predetermined period In general, according to both the FTC and the CFPB, an entity is in violation when its acts or practices—which covers commu - nication and advertising in any form of media, including social media—mislead a consumer in making a decision that causes, or is likely to cause, any harm in any way. 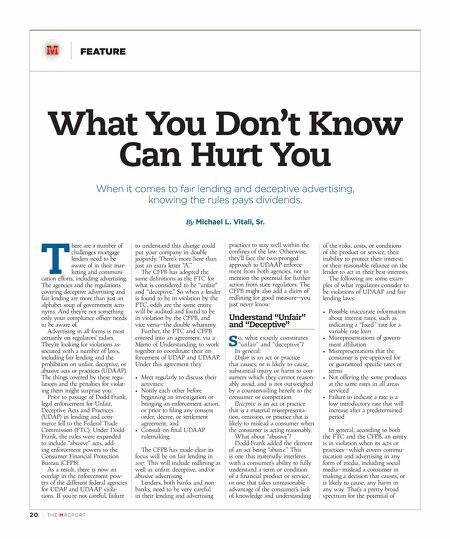 That's a pretty broad spectrum for the potential of What You Don't Know Can Hurt You When it comes to fair lending and deceptive advertising, knowing the rules pays dividends. By Michael L. Vitali, Sr.